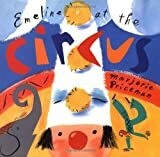 Emeline at the circus / Marjorie Priceman. Material type: BookPublisher: New York : Knopf : Distributed by Random House, 1999Edition: 1st ed.Description: 1 v. (unpaged) : col. ill. ; 26 cm.ISBN: 0679876855 :.Subject(s): Circus -- Fiction | School field trips -- Fiction | Teachers -- FictionDDC classification: [E] Summary: While her teacher Miss Splinter is lecturing her second-grade class about the exotic animals, clowns, and other performers they are watching at the circus, Emeline accidentally becomes part of the show. While her teacher Miss Splinter is lecturing her second-grade class about the exotic animals, clowns, and other performers they are watching at the circus, Emeline accidentally becomes part of the show.